Mar Mite is a familiar, one of over 300 in the game, and he and his friends are central to NNK’s battle system. Oliver may be a wizard, but for much of the game there are serious holes in his array of spells, and the two others who join his party are support characters, not damage-dealers. Enter the familiars, quasi-party members who collectively account for most of the game’s spells and skills. Different familiars learn different abilities and have different specialties – using some of my line-up as an example, Mar Mite is a physical attacker, Tintin (a blue-hued robot who puffs steam from his ears) is well-armoured and has the ability to temporarily draw enemy attacks, and the pint-sized Gemma (a little flying sprite with a mushroom-like cap) is a healer. Each of the three humans in the party can take three familiars into battle (with the rest residing in storage), and each human can switch between actively fighting, or sending in one of his/her three familiars instead. So for example, assuming Mar Mite, Tintin, and Gemma were all mapped to Oliver, I could start the battle with a spell from Oliver, switch to Tintin for a defence boost, switch to Gemma to heal the party, and then switch to Mar Mite for the coup de grace. Each character and his/her familiars share the same HP and MP pool, so blowing all of Oliver’s MP would leave nothing for Gemma to cast with. The familiars themselves double as the game’s bestiary – they roam dungeons and the overworld as monsters, but when defeated, there is a random chance they will be tamed and join the party. Once recruited, they gain experience and level up in standard RPG fashion, and high-level familiars can be upgraded into “evolved” versions. The tragedy of Ni no Kuni is that while it may contain 300+ familiars, I will only ever use a few. The reason is simple: poorly designed game mechanics. Each familiar must be separately levelled up; familiars who are not in the active 9 gain no experience, which punishes players for doing anything other than sticking with the same handful of familiars. Why would you experiment with new familiars when this would necessitate grinding them from scratch? This undermines all the effort the developers took to create the variety of familiars, and yet it would have been so easy to avoid. Familiars could simply take on the same level as their human partner. They could share a common level. If the player absolutely had to choose between levelling familiars, then there should have been a common experience pool. And I can think of more ideas (1). Similarly, obtaining new familiars is also a matter of grinding – go where they spawn, defeat them, and if they don’t join, repeat. And repeat. And, if necessary, repeat. This is bad design, consuming the player’s time in exchange for another pull of the slot machine, with nary an element of choice or skill in sight. But what if recruiting new familiars required an “interesting decision”? What if – for example – you had to choose between spending experience points on levelling existing familiars, or on purchasing new ones? That would have made Ni no Kuni a very different game. It might also have made it a better one. I like Ni no Kuni. And I love the familiars, in spite of the lousy way they’re handled. I like their punny names, their designs, their animations – static images don’t convey how adorable they are. Consider the Green Buncher, a familiar (second picture down) made out of bananas, right down to his feet – I named mine “Brunchy”. Then there’s the Turbandit, who upgrades to Turburn, Turban Myth, and Turban Legend; he doesn’t walk into battle so much as waddle, his head wobbling from side to side. One of the suggested names for a Turban Myth is “Myth Piggy”! And don’t forget the Potty, a creature that looks like a penguin wearing a jar – it upgrades to Jackpotty, Crackpot, and Hotpot. Mar Mite himself is a Mite, who upgrades to Mighty Mite, Mermite, and Dynamite. His default name is “Mitey”, but I found his name in the demo – “Mar Mite” –impossible to resist. How can you not love those names? That makes the familiars a good metaphor for Ni no Kuni, a game that is flawed in so many ways, but that often delights as well. Grindy familiars are just the tip of the iceberg – I could write paragraphs more about the failings of NNK’s battle system, plot, and characterisation – but the familiars also epitomise NNK’s appeal. In my review of Tearaway I wrote that a sense of joy is a “rare and precious thing, especially in this medium”, and it’s that joy that NNK produces in its best moments: naming a new familiar, watching as Mar Mite devours a snack or Brunchy hops along on his banana-feet, or simply thumbing through the in-game Wizard’s Compendium, which lists familiars together with a picture and a cute little blurb. 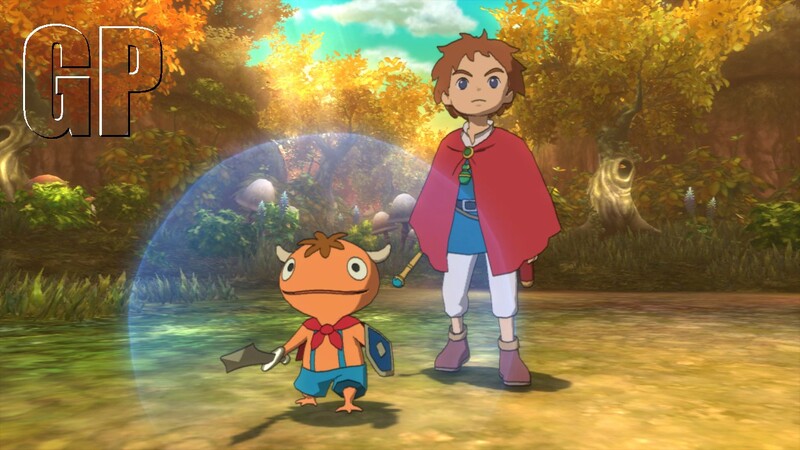 I could never call Ni no Kuni a great game – but I can say that it made me smile. (1) Persona 3 and 4 offer another interesting contrast; while personas level separately, just like familiars in NNK, higher-level personas are created by fusing together several lower-level personas. So you might fuse several tier 1s to create a tier 2, then several tier 2s to create a tier 3, meaning you will see – and use – many of their weird and wonderful personas. And unlike NNK, the Persona games discourage grinding: as your characters gains more and more levels, enemies bring in less and less experience.